Born as pure conduits to the web—showcases for Gmail, Drive, and other Google cloud services—Chromebooks have been stuck with a reputation that they’re useless offline. The basic complaint is that Chromebooks become nothing more than dumb, worthless, keyboard-equipped pieces of glass if your Internet dies off. 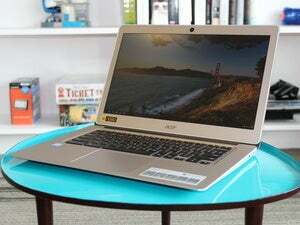 While that may have been an accurate description of first-generation Chromebooks, it’s not the case today. 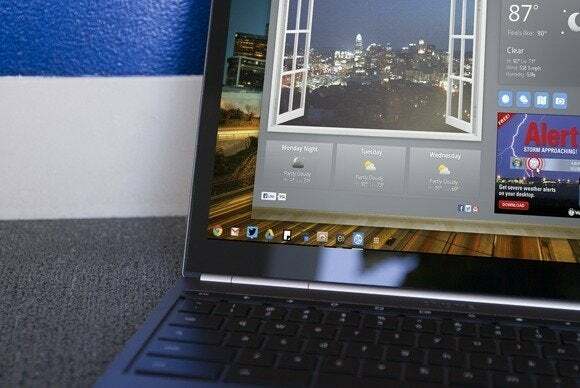 The offline abilities of Chrome OS have skyrocketed since the first Googley laptops hit the streets, and now Chromebooks can tackle many of the most popular PC uses—from blasting out emails to working on spreadsheets to even just playing movies—completely offline. Such capabilities may not be obvious at first, and it may take some work to ensure what you want is available offline. But we’ve got your back. Here’s a guide to everything you can do offline with a Chromebook, complete with instructions on how to set it all up. Let’s start with the cornerstones of the Chromebook experience. Google’s email and productivity solutions live and breathe on the web, but enabling their offline options lets you tinker with files and sift through your inbox away from the Internet. You can then sync all your changes when connectivity kicks back in. Install Gmail offline to access your messages if you’re not connected to Wi-Fi. 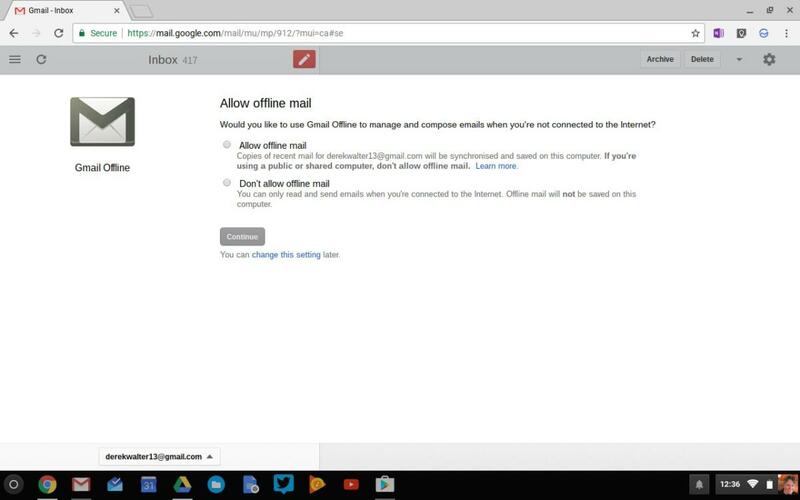 Chrome OS’s Gmail app doesn’t include offline capabilities natively, but that’s quickly fixed by downloading and activating Google’s Gmail Offline app, which mimes the look of the mobile Gmail apps. It will locally synchronize your messages and actions, which you’ll then be able to access while offline by opening the Gmail Offline app via an icon in Chrome’s New Tab page, or by selecting Gmail Offline in the Chrome App Launcher. 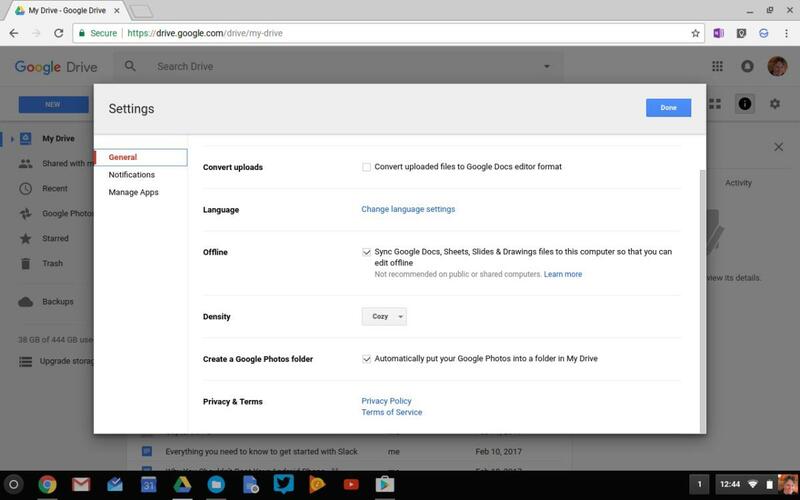 The menu options that allow you to activate Drive’s offline capabilities on a Chromebook. Enabling offline productivity is just as easy. Simply open Google Drive, then click the gear icon in the upper-right corner and select Settings. Open the General tab and check the box next to Sync your work to this computer so that you can edit offline. Presto! The process is even quicker with Google Calendar. Open it in-browser, click the gear icon and select the Offline option. Then, click the Enable button in the pop-up that appears. Calendar’s pretty much only good for viewing your schedule while offline, though—you can’t create or edit events. 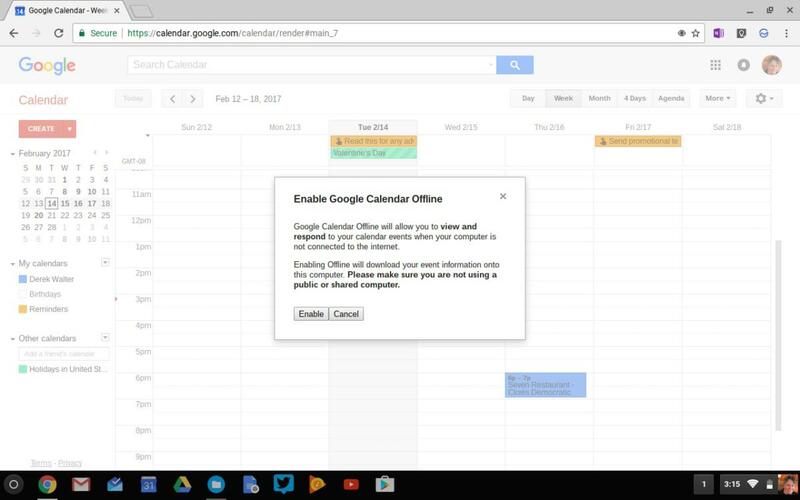 Your Google Calendar can be accessed offline with a simple tweak in the settings. Things are even simpler if you use Keep—Google’s rival to Evernote and OneNote—to store your random musings. Keep automatically lets you peruse your stash and whip up new notes even when you’re offline. However, not all of the data you generate on your Chromebook lives in discrete apps. 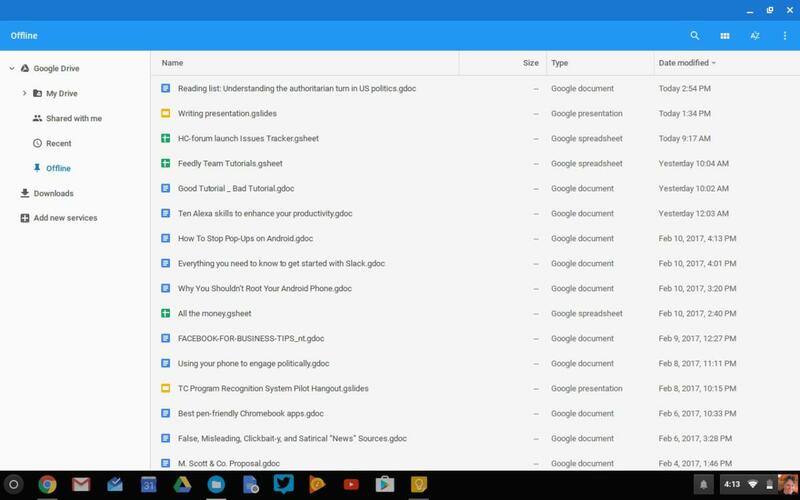 Chrome OS includes tools for working with local files, and those tools work just fine offline. You can view PDFs, view or edit Office files, play music and movies, and both view and lightly edit images offline. You’ll find your local files in the Files app. From the files app you can see which of your content is available for viewing or editing offline. Just double-click on one to open it in the appropriate file viewer. Google has also made a number of improvements to the Gallery app that makes it a more capable image editor. One more thing: To access a webpage while offline, use the Save as PDF option, found under the Chrome menu’s print section. It’ll save the page to your Chromebook’s local storage. Some websites, however, may appear with wonky formatting and be cumbersome to read. The biggest boon to offline productivity comes with the addition of Android apps, courtesy of the Google Play Store. Just like on an Android smartphone or tablet, many apps cache data on the device so you can keep working if disconnected from the Internet. For example, Adobe Comp CC works completely offline, allowing you to create graphics or edit images. Adobe Comp empowers you to do design work while offline. Also, Microsoft Outlook lets you view your messages when disconnected from the Internet. The real work (like replying or archiving) needs to wait until you’re back online, but it’s better than a blank screen. 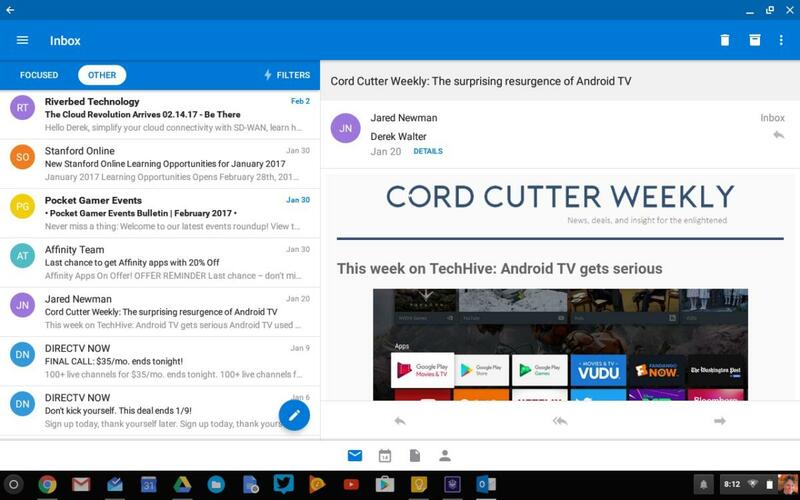 Outlook for Android keeps you connected to email while your Chromebook is offline. Most Android apps are still designed with phones primarily in mind, but they might offer useful offline capabilities. The Play Store will be available on all Chromebooks released in 2017 onward. It’s coming to a limited batch of existing notebooks—check the running list updated by Google. Chrome OS’s offline chops aren’t limited to work-related functions. You can take your play offline, too. And no, it’s not just limited to slapping a thumb drive stuffed with movies into your Chromebook’s USB port. 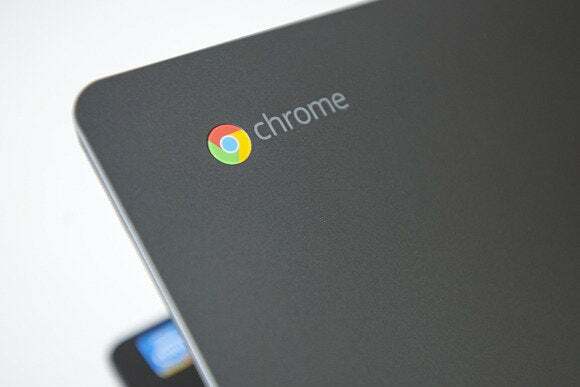 Chromebooks support offline movie and TV show playback for Google Play, the company’s app and media marketplace. Any content you’ve purchased through the service can now be saved locally—at least if you’re using a Chromebook. Just look for the small, gray download icon at the bottom of a listing; clicking it saves the film for offline viewing. Note that you’ll need to install the separate Google Play Movies & TV app to see the option. 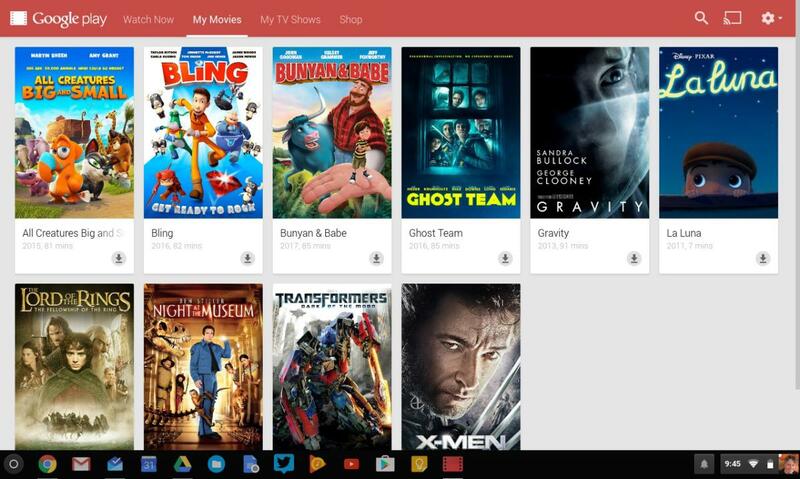 Google Play Movies can save your favorite programming offline. Stingy storage specs help keep Chromebook prices lows, but you’ll want to keep an eye on your available space, and be diligent about removing movies you’ve already watched. Going into the Play Store app’s settings and unchecking the “Prefer high quality audio” button can help stretch capacity. As for music, Spotify’s Android app works well on Chromebooks. You can download a playlist for offline listening if you have a subscription. Google Play Music has a similar capability, but I found the Android app to be buggy and inconsistent compared to the Chrome version. 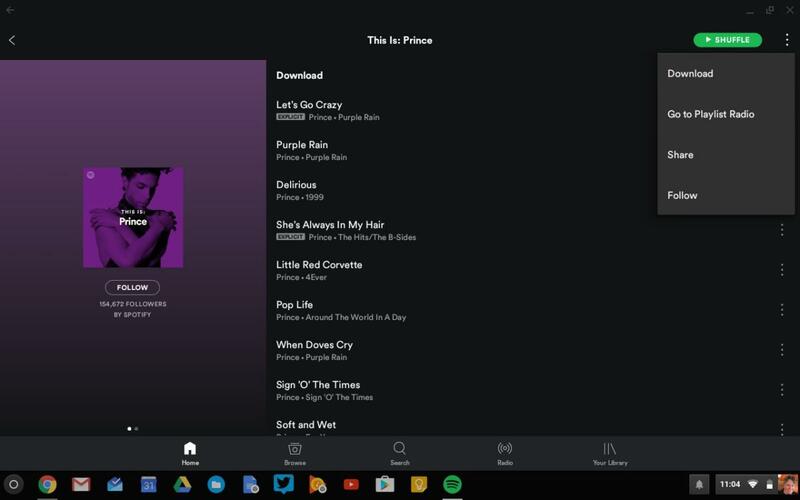 Spotify brings offline listening to your Chromebook. Literary fans will want to check out Amazon’s Kindle Cloud reader. This app automatically downloads the book you’re currently reading so it’s available offline. You can also manually save books for offline reading. Chrome Apps run in their own window, separate from the browser. 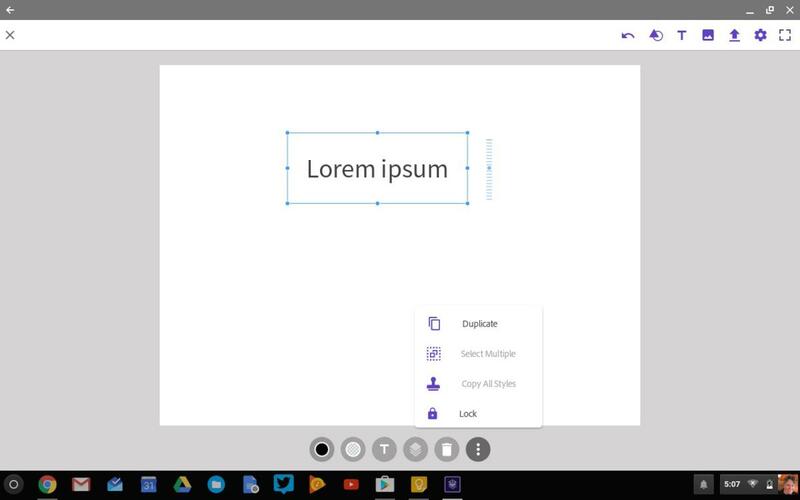 While Android apps are finding their way to Chrome OS, for the time being it’s still Chrome Packaged Apps that offer the best level of polish. While they've lost that formal 'packaged' name, they're still infused with proprietary Chrome APIs, which grants them access to your laptop’s hardware and essentially transforms them into traditional desktop software, complete with discrete out-of-browser windows, full offline capabilities, and the ability to utilize local storage and resources. 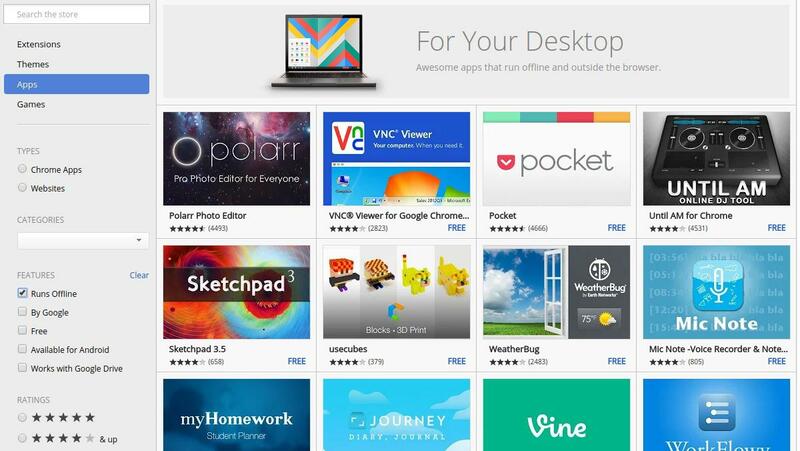 The Chrome Web Store’s ”For Your Desktop” section houses the available packaged apps, augmented by an even larger offline-enabled section. Of particular note, the Polarr is a powerful photo-editing tool, and the Pocket read-it-later app is a stellar resource for folks who loathe saving whole webpages for offline viewing. The Chrome Web Store highlights apps that will work even if you’re offline. Chrome is ending support for apps on Windows, Mac, and Linux, but they will remain for Chrome OS. So there you have it: Chromebooks are stuffed with all sorts of offline functionality, provided you know where to look—and now you do! This article was originally published July 17, 2014, and updated February 15, 2017.